I rolled my eyes in exasperation, glaring at Kira. I shook my head vigorously, darting away from her as I headed to my locker. She followed me like a lost puppy. “Yes,” I deadpanned, slamming my locker shut once I’d stolen its hidden treasures. I tried to shake the guilty feeling building in the pit of my stomach. We’d been having this argument for the past week now. Kira knew I hated clubbing, namely because God gifted me with two left feet, and yet she still asked me to accompany her. Apparently, it was in the Best Friend Rulebook. Evidently, I forgot to read the small print. I turned to Kira, retort at the ready, but paused when I saw her pouting. Her big blue eyes sparkled adorably and her lower lip jutted out at just the right angle. Kira’s pout was legendary. It was that pout that got her out of internal exclusion for swearing at another student. The teacher was fuming but Kira pulled out her pout and BAM! Problem solved. If the teacher couldn’t say no to it, what chance did I have? “I hate you,” I muttered, shuffling forward as the line for the club advanced a couple steps. We were almost at the front now, thank God. My heels were already beginning to hurt. The two then proceeded to get into a prolonged debate over which birthday was better, your 18th or your 21st, while I stood there awkwardly, ever the third wheel. Finally, we reached the gruff doorman, who asked for our IDs before letting us pass. The techno music assaulted us as soon as we entered and it took a second for my eyes to adjust to the flashing lights. When they did, I turned to tell Kira that I was heading to the bar. I froze in panic. Where was she? A brief search told me she’d already dragged the guy from the line over to the dance floor. The two were chatting like they’d known each other their whole lives. Deciding to just wait the evening out, I headed over to the bar and slumped down on a stool, hugging my clutch to my chest. I paid for a coke and sipped it slowly, keeping an eye on Kira to make sure that the man was behaving himself. “Morning, beautiful,” a deep voice murmured in my ear. I tore my gaze away from the dance floor to find a gentleman seated beside me. His brown hair was disarrayed and his eyes appeared yellow, I assumed due to the lighting. He wore a crisp white shirt opened one button at the top. “It’s evening,” I pointed out, allowing my eyes to wander back to Kira. She was laughing at something and seemed happy enough. “Not for my species.” He flashed his fangs at me, and his yellow eyes suddenly made sense. “Oh?” he repeated, relaxing again. I snorted. “What else do you want me to say? So you’re a different species to me. Build a bridge and get over it already! Species is just like race; neither should matter.” We sat there in silence for a few moments, both lost in thought. This entire night was just surreal. Ever since vamperwolves had come out of the closet a few years ago, I’d never actually met one. Well, to my knowledge anyway. And now here I was, talking to a living, breathing half-vampire, half-werewolf creature. As blasé as I was trying to act, I was still impressed. “You know, you’re probably the only woman I’ve met who hasn’t fallen at my feet when I told them my species,” the man commented. His yellow eyes regarded me with renewed interest. “Yeah, well. That Polly girl was a good writer. She did a good job at making your species seem awesome,” I replied. A mocking smile twitched at my lips. “You say that like you don’t believe it,” he remarked. “My species happens to be epic!” His eyes narrowed when I smirked. I shivered before steeling myself. I refused to be intimidated. He was just an ordinary guy, after all, and I had the law on my side. Vamperwolves really couldn’t afford to go around murdering people with the media focused on them as they were. So instead of showing the fear that had begun to grow within me, I frowned at him. “Well Oliver the Vamperwolf. I’m Leah the Human. Pleased to make your acquaintance.” I tilted my glass towards him in a half salute. He grinned. “Likewise.” When he saw me having difficulty hearing, he shuffled closer to me. “So what are you doing here on this fine morning?” His voice was loud, but I could hardly hear him over that techno racquet. I sighed. “She’s over there having the time of her life while I’m stuck here with you.” I clutched my chest dramatically. “Whatever did I do to deserve such a thing?” I wiped at an imaginary tear. “Still you,” I retorted, finishing off the last of my drink. “Not going to buy one yourself?” I questioned, nodding to the empty space in front of him. His grin turned dark. “There’s only one kind of liquid I’d care to ingest.” He leered at my exposed neck. “I have a sixth sense,” I said seriously, best cocky look in place. I opened my mouth to reply but was cut off by a familiar arm wrapping around my shoulders. “Well don’t you two look cosy,” Kira commented. She gave Oliver her back as she hugged me in greeting, whispering, “He’s hot!” in my ear. I rolled my eyes as she pulled away. “Oliver, Kira. Kira, Oliver,” I shouted over the music. “It’s lovely to meet you, Kira. Happy birthday.” He smiled at her, pulling out the charm. Kira nodded, bid Oliver goodbye and weaved through the crowd towards the exit. 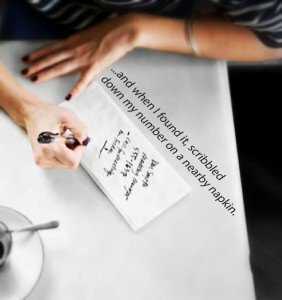 Gulping down the last of my drink, I rummaged around my clutch for a pen and when I found it, scribbled down my number on a nearby napkin. Oliver stuck his tongue out at me. The gesture was childish and adorable – I laughed all the way to the exit. After reuniting with Kira, we began the trek back to my car. The night was cold but the breeze was welcoming after the suffocating heat of the club. The streets were deserted, most people having already holed away for the night. “So…Oliver seemed nice,” Kira commented, waggling her eyebrows suggestively. I elbowed her. “Purge those dirty thoughts from your mind. He’s my friend. That’s it.” Admittedly, I was beginning to question the wisdom of my actions but I refused to acknowledge my doubts at the moment. “Finish that thought and you’ll be walking home,” I warned her. That shut her up quickly enough. However, it was when I was driving us both home that it really hit me. I’d just made friends with a vamperwolf. Good job incorporating Polly’s story into it. I really like the story, and the dialogue is really cool! I thought this story was neat! BTW, my name is Leah! This story is really good! Love the witty dialogue. Oliver seems like more than the typical teen bloodsucker who happens to look like an Adonis, and Leah’s refusal to be charmed by him is refreshing. She reminds me of Polly, actually. Good work! Thanks for reading! I’m glad you enjoyed it and I really appreciate the feedback. I actually based Leah on Polly, so I’m glad that I was able to get that across.